Rob Stead and I loaded up in the Element and headed down to America. 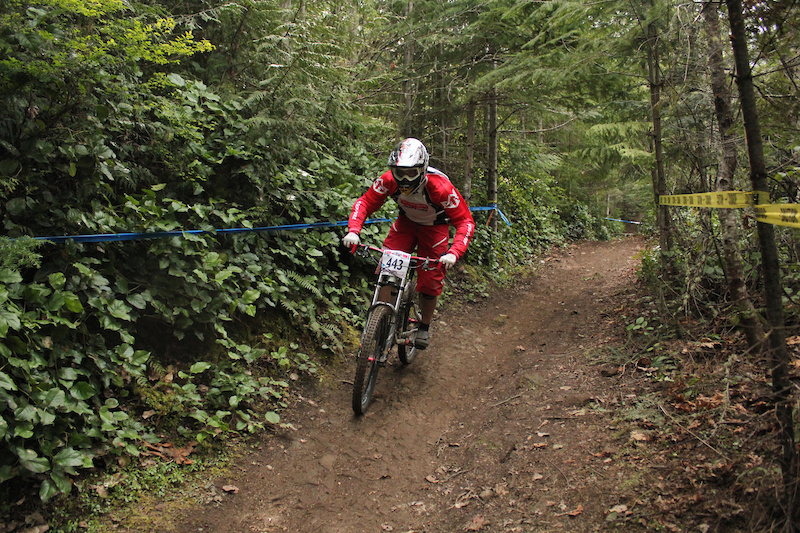 Our destination was Port Angeles in Washington State for the second round of the NW Cup. 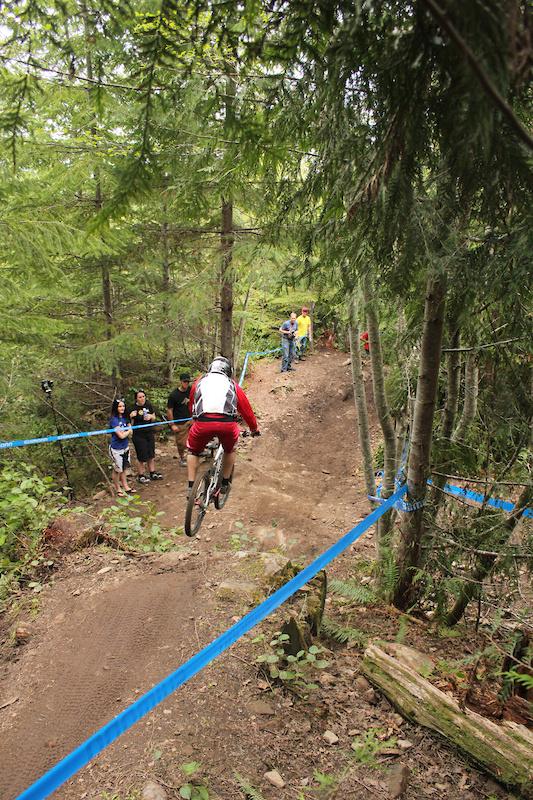 I had raced in Port Angeles back in 2009 and was impressed with the event organization, the course is a blast to ride, and the competition is always strong. For the very reasonable price of $65 you get three days of shuttles. So we took the day off work and arrived at the race site at 1pm on Friday. We geared up and got out on the race course. I loved the entire race course and had a perm-grin all my face from the very first run. The track had a good mix of features with a wicked flow from top to bottom. Speeds were high, minimal pedalling and lots of corners to rail. Even though we showed up an hour after practice had started we got in 9 fun filled runs. We headed back to the hotel, got cleaned up, and had some drinks. 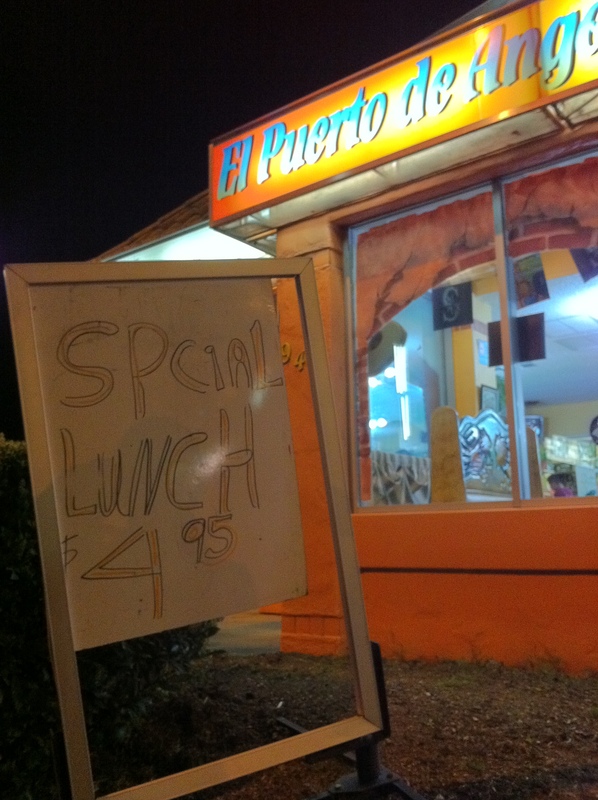 After dinner at a local Mexican restaurant we hit some sketchy bars. It was my birthday so some celebration was in order. 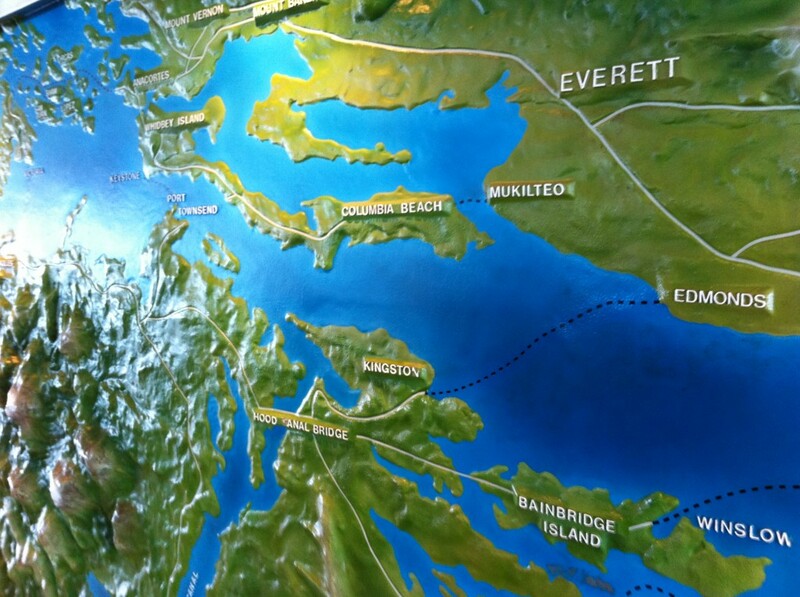 For the record, if you’re single and looking for a hot place to pick up someone I’d fully not recommend Port Angeles. One of the interesting ideas behind the racing scene in Port Angeles is that the Pro and Cat 1 categories race on one track, and the Cat 2 and Cat 3 categories race on another track. Fridays practice was open for all categories. However for Saturday things get split up even further. For the morning the Cat 1’s and Cat 3’s practice. For the afternoon the Pros and Cat 2’s practice. This means that you very rarely run across a slower rider, and slower riders don’t have to ride all day fearing they’re going to get stream-rolled by some one that is barrelling down the course. This meant we had no good reason to get up early, so we all slept in, and meandered our way to the race site. We got in a good walk down the course, and got ready for practice. Saturday’s practice went well. It was supposed to pour today, but the rains held off and the sun was shining. I was having so much fun on my bike I couldn’t help but exuberantly high five everyone at the end of every lap. I got in another 8-9 laps in a few hours on Saturday afternoon. 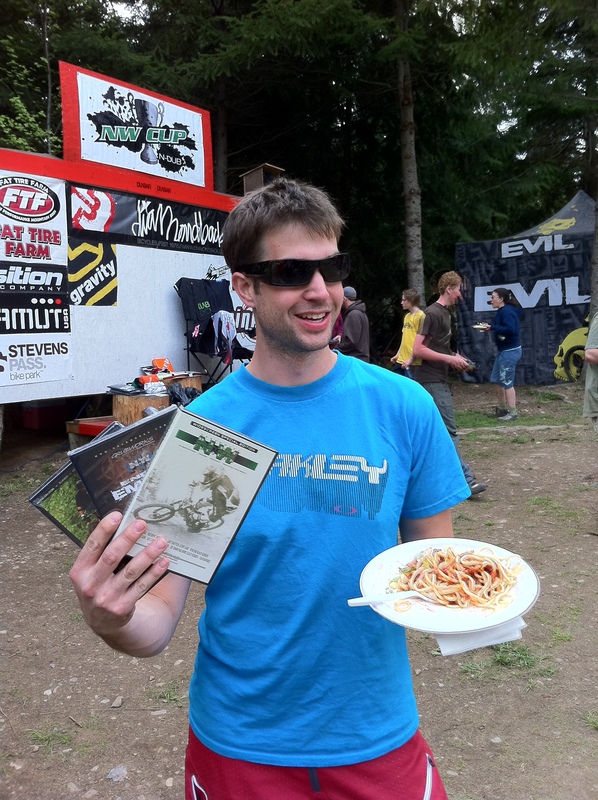 Once practice was over there was a complementary pasta dinner for all the racers and some DVDs of riding from the area. How could this race get any better? $65 for three days of shuttles, bike videos and a dinner? Once dinner was finished we loaded up and heading back to the hotel. During that trip the heavens opened with torrential rain. Tomorrow was going to be soggy. We woke up to rain battering the windows. It had poured all night. We got up, had a quick breakfast and headed for the race site. Each rider was allowed a single practice run, and then the Pros had a seeding run. Once we arrived I decided to try some cut down spike tires I had made during the week. I had an absolute blast on my first practice run down. I hadn’t used cut spike tires before, but they worked really well on this race course. That said the folks that stayed on their dry tires said the course was just as fast and grippy as it was the two previous days. I had such a good time in the wet I asked one of the organizers if we could go up for a second practice lap. That was no problem and a second very wet but grin inducing run was had. I debated switching back to dry tires for my seeding run, but I was having so much fun railing turns on the spikes I left them on. Glenn, Rob, and I loaded up and headed for our seeding runs. I had a good clean, smooth seeding run. I pushed in some spots, but saved energy for my race run. I seeded 10th and knew I had lots of time left on course. On my race run I left the gate sprinting. I rode the top section well and felt quick. I made a small error in the trees and lost a bit of time. I then got a bit greedy entering one of the high speed corners that lead on to a long straight. I drifted through the turn and wound up sliding way inside the corner and lost all my speed. I cursed, and sprinted as hard as I could down the straight. I rode the rest of the course well but crossed the line shaking my head, disappointed at the costly mistakes I made on course. My time popped up on screen and I had improved my seeding time by 6 seconds. 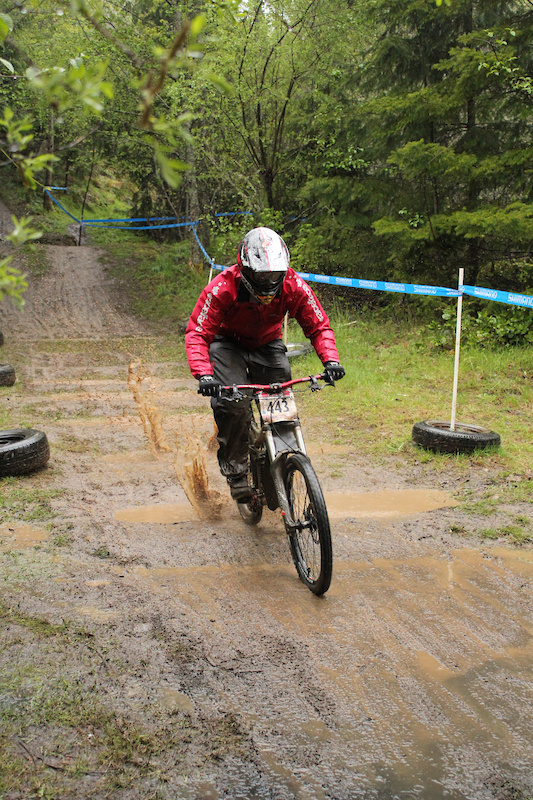 Quickly the remainder of the racers crossed the line, and by the time the mud had settled I finished up 9th place in Pro. I was happy with that result as I was only 9 seconds from the win, with a messy run, and 4 of the 5 guys on the podium are World Cup racers. All in all it was an awesome week-end. 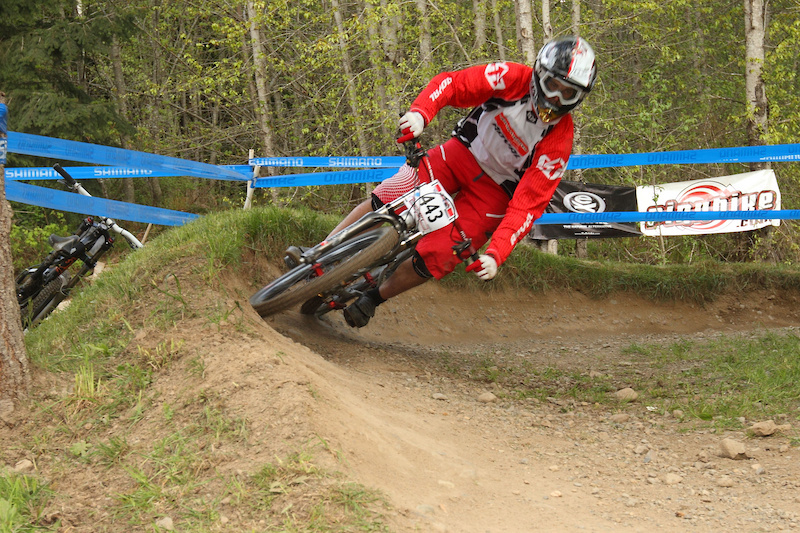 The new Norco downhill bike I was piloting was sensational to ride all week-end. When this thing comes out, hopefully for 2012, do yourself a favour and have a go on one, you’ll be glad you did. The course was phenomenal. I had loads of fun hanging out with Glenn, Rob, Dodsy and Gabby. I’m happy with my result, and can’t wait till the next one, which will be BC Cup #2 at Bear Mountain. Adieus.